After countless fits and starts and years in development, New Line Cinema has decided to cancel their plans to remake Escape From New York, according to Deadline. 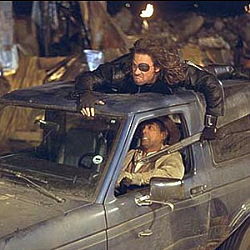 The original film is considered a classic to many action fans, and features Kurt Russel as Snake Plissken, the iconic eye-patch wielding anti-hero. Set within a dystopian future where New York has become an overgrown prison, convict Snake is sent in to save the President to earn his freedom. The original is pulpy and fun, but producers interested in the remake claimed to look into giving the film a “Dark Knight” type makeover. As a fan, I can safely say thank god New Line have changed their minds. Comments for New Line Abandons “Escape From New York” are now closed.